Beringbooding Rock isn't well known, perhaps something to do with it's slightly out of the way location. 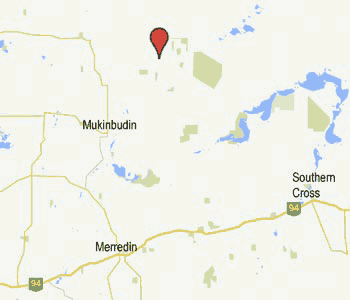 From the small town of Mukinbudin - a great little town, but not exactly a tourist hub - it is a 70km drive north, further away from civilisation. After passing through the outpost of Bonnie Rock, where the sealed road ends, a few more kilometres along an excellent gravel road takes you to the car park and picnic area (with toilet) at the base of the rock. Beringbooding Rock's value as a water source is apparent from the car park, next to which is a massive water tank. The great expanse of the rock acts as the water catchment; the low wall built around the perimeter of the rock catches the rainfall run-off and channels it across an aqueduct into the tank. A roof over the tank preserves the precious water from evaporation during the long dry spells. As I walked across the rock, baking and bone dry even at the end of autumn, it was hard to imagine enough water flowing over the surface to fill the humungous tank. But it does happen, sometimes. 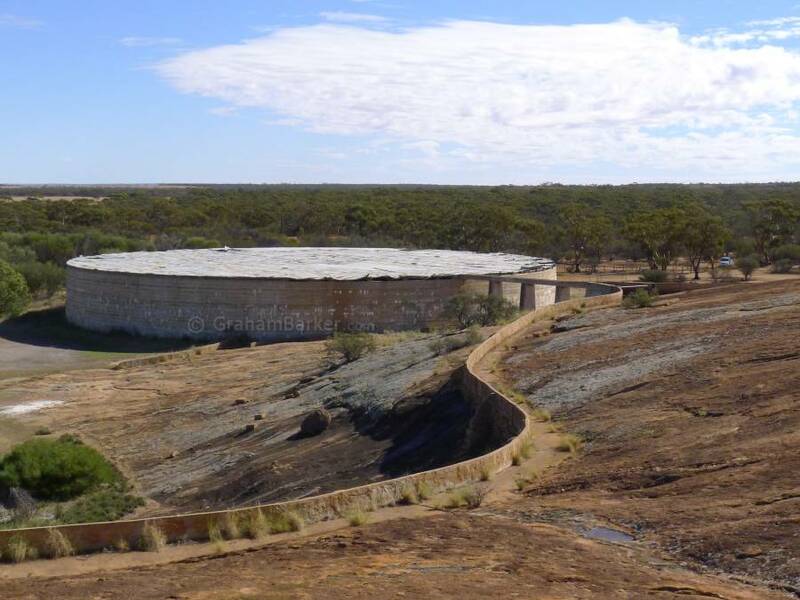 When the rock catchment and tank were completed in 1937 the water played a vital role in the opening up of this dry corner of the wheatbelt to farming. Beringbooding Rock has the largest rock water catchment tank in Australia, although other good examples can be found elsewhere in WA's rock-studded inland. Merredin has a big rock and dam close to town, and the famous Wave Rock also has a low wall on its top to catch rain run-off. Speaking of wave rocks, the northern side of Beringbooding Rock also has the beginnings of a rock wave. 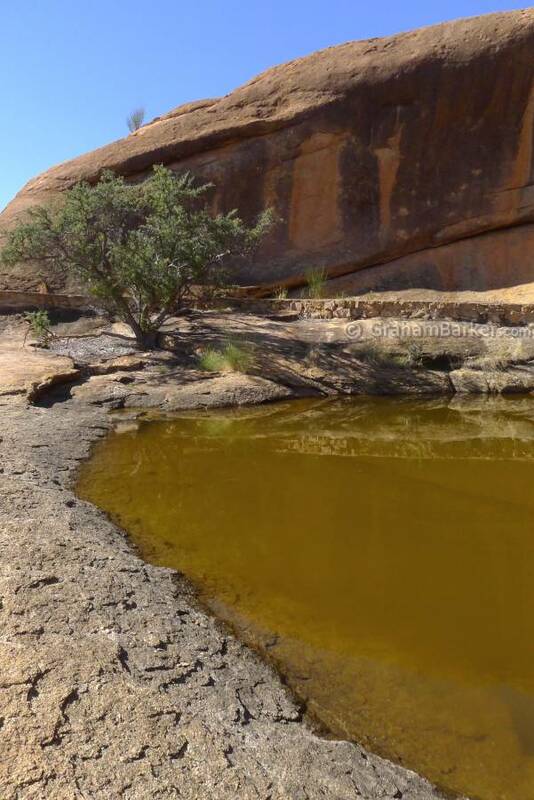 It's really just a steep indentation, slightly overhanging, with a waterhole at its bottom, but is evidence of the same erosional forces which created the breaking wave structure of Wave Rock. 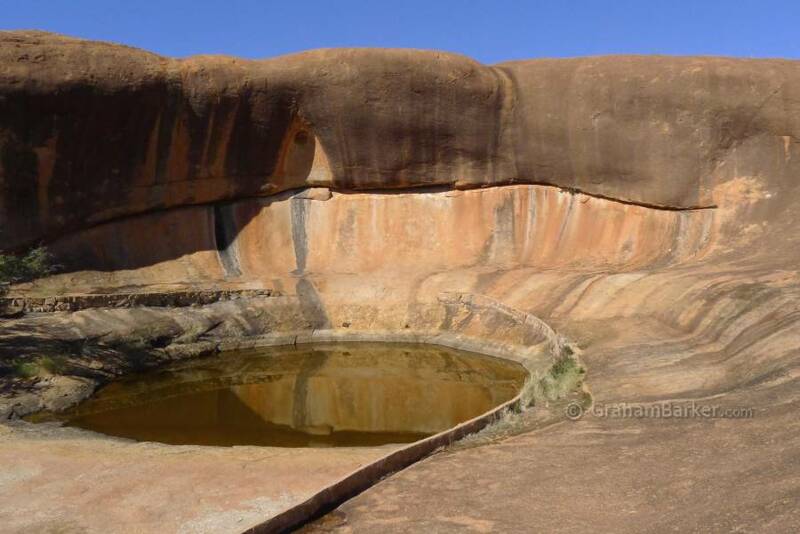 The shape, rock colours and out-of-place pool of water - known to the local Aboriginal people as a gnamma hole - make a picturesque scene. From the car park it's not far away on the left side of the rock. If time and weather permit, a walk over the top of the rock to the far side can be interesting. 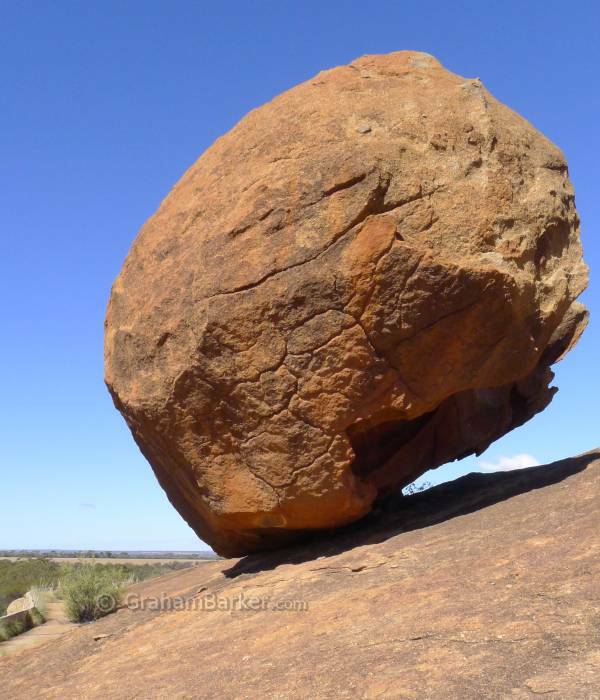 Apart from views of the surrounding country, some precariously balanced boulders can be seen, with some overhangs and small caves in massive boulders at the furthest edge. I didn't find the Aboriginal hand paintings on the walls, but by that stage the flies were getting a bit annoying and my focus was probably waning. 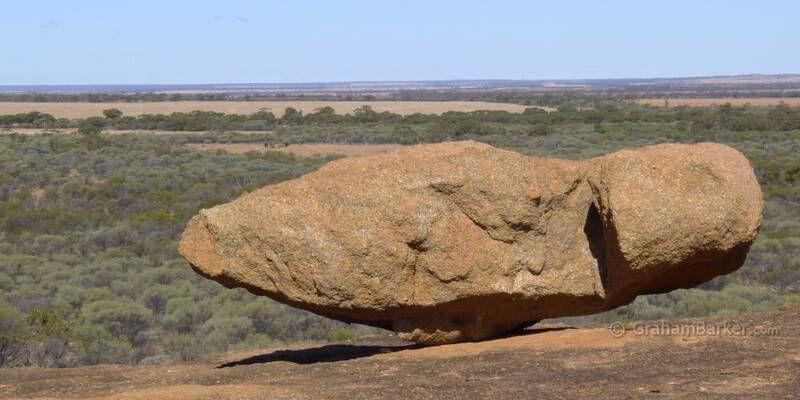 For anyone touring Western Australia's wheatbelt - a very under-appreciated region, in my opinion - a visit to Beringbooding Rock can be rewarding. Especially if you like wandering around undeveloped natural features, and especially if combined with a visit to the impressive Elachbutting Rock which is nearby.